Henry Cuellar turned out to be the only Texas democrat to vote for the TRAIN Act. It's no surprise, really. He's anti-regulation. He's been known to be a darling of the right. And he's really never shown any serious consideration for the environment. What's more surprising about his vote is that this bill has no chance of going anywhere. The Senate has no interest in it, and the White House has said that it would veto it if it reached the president's desk. 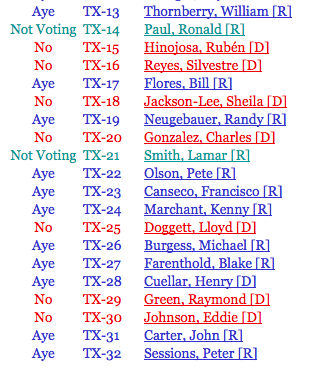 So Cuellar didn't have to vote for it. But he did and only because he needs to show energy companies that he's got their backs. It's all good anyway. It's not like Mercury in the air is going to kill us.